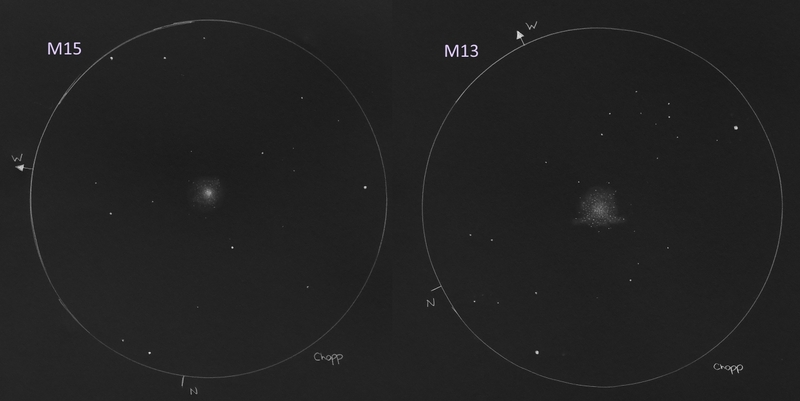 Please accept my sketches of this beautiful pair of globular clusters, M15 in Pegasus and M13 in Hercules. Both globular clusters are spectacular objects by themselves but I thought it was interesting to pair them side-by-side to compare and contrast. M15 is smaller, has a more densely packed core and a more symmetrical shape M13 is larger, has a more loosely packed core and meandering streams of stars. The sketches were made on the nights of 9/24/2014 and 9/27/2014 respectively from a fellow club member’s observing field near Green Bay, WI using my 10” Discovery Dobsonian telescope at 120x. They were made using white paper with HB and 2B graphite pencils and blending stumps to smooth. Image colors were inverted using Paint.NET. I hope you enjoy it. By clicking on the image you get a larger view. I like your side by side sketches at the same magnification. You have done a great job showing how dense the core of M15 appears by comparison to the more diffuse nature of M13. Green Bay must be getting a bit chilly now! Very impressive sketches! They are realistic and detailed.